The Georgian military claims it has downed a Russian fighter jet over South Ossetia, but the Russian Foreign Ministry on Friday morning denied it had lost any aircraft in the region. Meanwhile, in Moscow, Russian President Dmitry Medvedev is heading a meeting aimed at halting the violence. The Kremlin press service issued a statement saying the meeting was also focusing on measures to protect the civilian population and Russian citizens in the conflict zone. 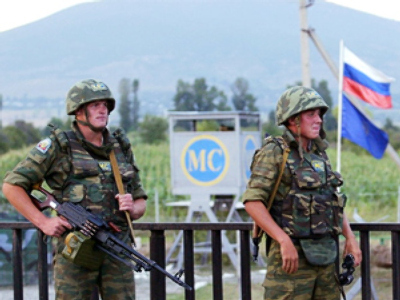 Russian peacekeepers, said the statement, “have a mandate…to safeguard Russian interests in the region”. Speaking at a press conference in Moscow, he said: “They want to cleanse South Ossetia of [ethnic] Ossetians, and this is what the Georgian armed forces are doing now”. The South Ossetian information committee said that Russian citizens among South Ossetians hiding from Georgian shelling have taken shelter in basements in the region’s capital, Tskhinvali. The region’s hospital has been destroyed by shelling, according to the Interfax news agency. The extent of civilian casualties as a result of the fighting has not yet been determined.